Margret is a Nord citizen visiting Markarth from her home in Cyrodiil. As you enter Markarth for the first time, you may notice her shopping at a market stall, busy discussing her purchase with the stall manager. Weylin will suddenly grab her and attempt to kill her. You can either let this happen, or save Margret by killing Weylin. If saved, she will be thankful and remark, "By the gods, that man nearly killed me. You saved my life. Thank you. Here, I was going to bring this to my sister, but I think you should have it." before giving you a necklace. Saving Margret can be helpful in later quests having to do with investigating the marketplace attack. Since Margret will still be alive, you can ask her directly about the attack instead of having to ask multiple unwilling witnesses. 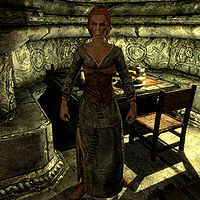 While speaking with Margret in the Silver-Blood Inn during The Forsworn Conspiracy, if you ask her what she is doing in Markarth, she may reveal herself to be an Imperial agent, her attention focused on the Markarth Treasury deed. She has the intention of either buying or stealing it for General Tullius and the Imperials, but has been unsuccessful thus far. She wears a set of farm clothes and a pair of boots. She is equipped with a steel dagger, and carries a key to her room. This page was last modified on 17 March 2019, at 16:30.